IDF Chief of Staff Lt.-Gen. Benny Gantz told a memorial gathering Monday that Israel's enemies are trying harder than ever before to attack. 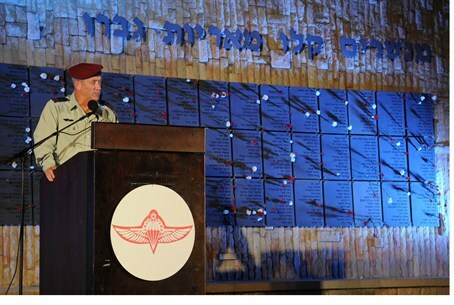 IDF Chief of Staff Lt.-Gen. Benny Gantz told a memorial gathering to commemorate fallen soldiers Monday that our enemies are trying harder than ever before to attack the State of Israel. Gantz made a point of referring to the terror attack Friday that ended the life of 20-year-old IDF Cpl. Netanel Yahalomi, who was shot and killed Friday on the border with Egypt as he was going to offer water to African migrants attempting to enter the country illegally. Before he died, Yahalomi managed to fire 23 shots at the terrorists, saving the life of a comrade who was seriously injured. Other soldiers in his unit and a second IDF patrol located and eliminated the three terrorists, including one who was wearing an explosives belt, who had attempted to infiltrate through the border. The terrorists “planned to carry out a lethal and massive terror attack, but encountered a prepared and professional force of male and female fighters which successfully thwarted the terrorists' action,” Gantz said. Speaking at Sunday's cabinet meeting, Prime Minister Binyamin Netanyahu said that the attack emphasized the importance of completing the security fence in southern Israel. The attack occurred in an area where the fence has not yet been completed. A terror group calling itself Ansar Beit Al Makdas on Sunday said it had carried out the attack.